Starz announced today that the fourth season of the Emmy®-winning Original series Black Sails will bring fans to the heroic conclusion of the Treasure Island prequel. The 10-episode fourth season of the stand-out high seas drama returns in 2017, and finds our pirates at war in the West Indies. The shores of New Providence Island have never been bloodier, but the closer civilization comes to defeat, the more desperately, and destructively, it will fight back. "It's a rare privilege in television to be given the kind of creative freedom we've enjoyed on this show over the last four years. While it was a difficult decision for us to make this season our last, we simply couldn't imagine anything beyond it that would make for a better ending to the story nor a more natural handoff to Treasure Island," said series co-creator and executive producer Jonathan E. Steinberg. "We'd like to thank Chris, Carmi and everyone at Starz for all their faith and support, and to our astounding cast and crew for joining us on this ride." 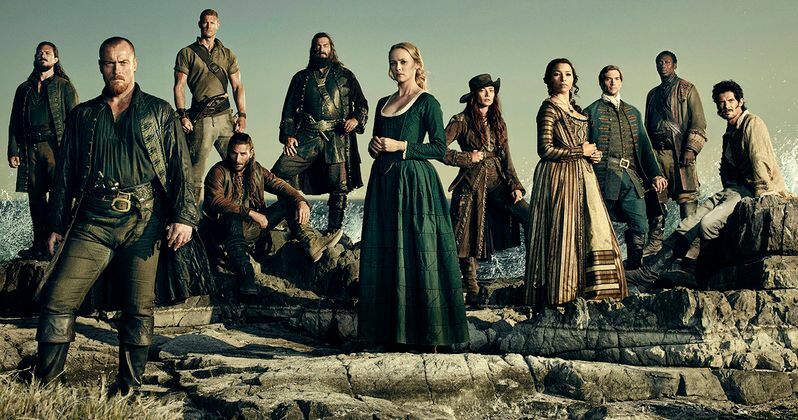 "Jon Steinberg and Robert Levine, along with their crew and the phenomenal cast, have delivered a spectacular take on the most legendary pirate story in literature, and this final season will bring us to the shores of Treasure Island as was always intended," said Starz Managing Director Carmi Zlotnik. "'Black Sails' has been a tremendous success; from the loyal fan following and strong viewership numbers to awards recognition and the skill of our world-class production in Cape Town, we could not be more proud of this very special series." The first three seasons of Black Sails averaged 3.6 million multi-platform viewers per episode* and the series is distributed in nearly 200 countries and territories worldwide. Black Sails has been nominated for multiple Emmy Awards, and won in 2014 for Outstanding Special and Visual Effects in a Supporting Role, and Outstanding Sound Editing. The show was also nominated for the 2016 GLAAD Awards for "Outstanding Drama Series." Black Sails takes place twenty years prior to Robert Louis Stevenson's classic, and follows the most feared pirate of the day, Captain Flint (Toby Stephens). Black Sails is created by Jonathan E. Steinberg ("Jericho," "Human Target") and Robert Levine (Touch) and executive produced by Steinberg, Levine, Michael Bay (the Transformers franchise, Armageddon, Pearl Harbor), and his Platinum Dunes partners Brad Fuller and Andrew Form (Teenage Mutant Ninja Turtles franchise, The Purge), as well as Chris Symes (Hellboy II: The Golden Army, Eragon), Brad Caleb Kane (Fringe, Crash), and Dan Shotz (Jericho, Harper's Island). Black Sails stars Toby Stephens as the brilliant and unstoppable Captain Flint. Stephens is an accomplished film, stage and television actor, who appeared in the feature film 13 Hours: The Secret Soldiers of Benghazi directed by Michael Bay and released in January 2016, and is well-known for his role in Die Another Day. He starred in BBC's "Vexed" and on stage in "Noel Coward's Private Lives," and his many film credits include Believe and Twelfth Night. London-born Hannah New, who portrays 'Eleanor Guthrie,' starred in the miniseries, "El Tiempo Entre Costuras (The Time Between Seams)" and most recently in 2014's Maleficent. Luke Arnold, who portrays the classic character 'John Silver' in the years before his well-known feats, has appeared in "McLeod's Daughters," "Rush," and most recently starred in the miniseries "INXS: The Michael Hutchence Story." Jessica Parker Kennedy, who plays 'Max,' a former prostitute with an eye towards advancement, is known for her work in the television series, "The Secret Circle," and has appeared in the films 50/50 and In Time. British actor Tom Hopper , who portrays 'Billy Bones' of "Treasure Island" fame, is most well-known for his role as 'Sir Percival' in "Merlin" and appeared in Northmen - A Viking Saga. Zach McGowan is featured as 'Captain Charles Vane,' a rival pirate to Captain Flint. McGowan is most well-known for his roles in the series "Shameless" and "The 100." Ray Stevenson, known for his roles in "Rome," Insurgent, and Divergent, joined the cast in season three as the iconic pirate Blackbeard.